This is the 24 Hour Fitness in Point Loma, CA (San Diego County). It is the meat market of them, as celebrities have been known to frequent this particular location. 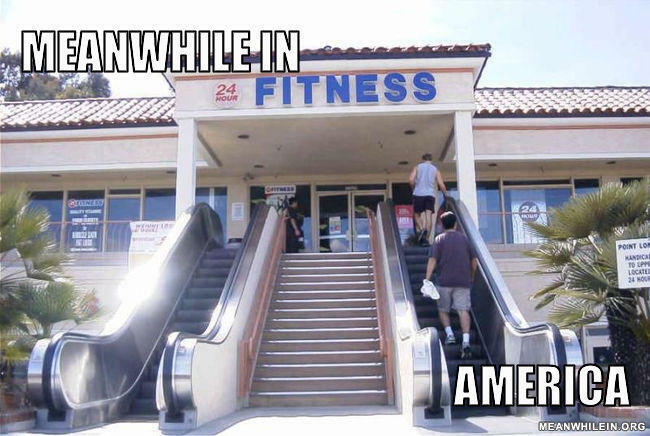 Hey, don't want to get spent before your workout; already walked 20 yards just to get to the escalator. i guess it's there to help fat people get up the stairs seeing as how some of them have trouble...'moving'. At least it's open 24 hours! So after a McDonald's run you can "work out". Steps are difficult after a good workout. We are the laziest ppl ever! A walk up the stairs is a days worth of exercise here! Q: A vandal walked into a bar. What did the bartender say?